A few weeks before Christmas (I'm sorry, but how does that already feel so long ago?! It's mad how fast time's going! 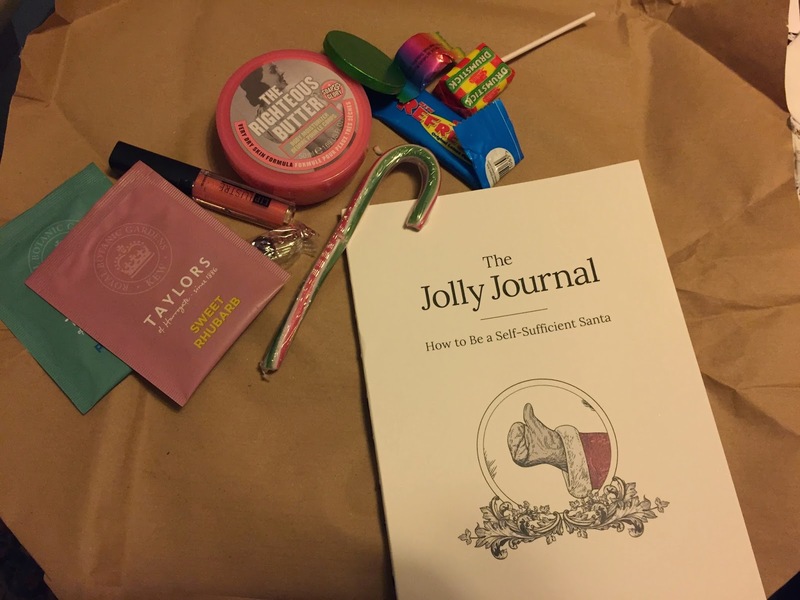 ), I was lucky enough to win the lovely Lauren's giveaway for The Jolly Journal. The Jolly Journal is a book compiled of a number of bloggers' recipes and suggestions for a wonderful Christmas, especially aimed at young people who may be hosting their first Christmas in the next few years. As this could be me in not all that long really and there is honestly nothing better than bloggers' advice and recipes, I was over the moon to find out I'd won a copy. Receiving a parcel in the post always puts a smile on my face - receiving something personal that's not a bank statement telling me how skint I am is always something to be happy about! 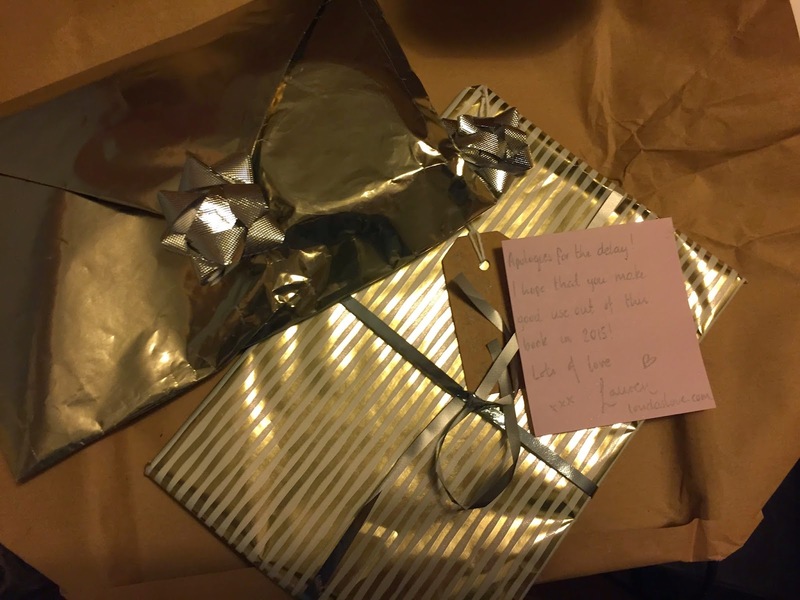 Lauren packaged everything beautifully and it felt a bit like Christmas again opening this parcel and finding wrapped up presents inside. I have been truly spoiled with all the goodies I've been given! I've had a good flick through The Jolly Journal and have found a number of recipes that I'm sure I'll be trying out all year round, and some which sound absolutely perfect in the run up to Christmas. Also, where would a girl be without some Soap & Glory body butter and some Taylors of Harrogate flavoured tea?! 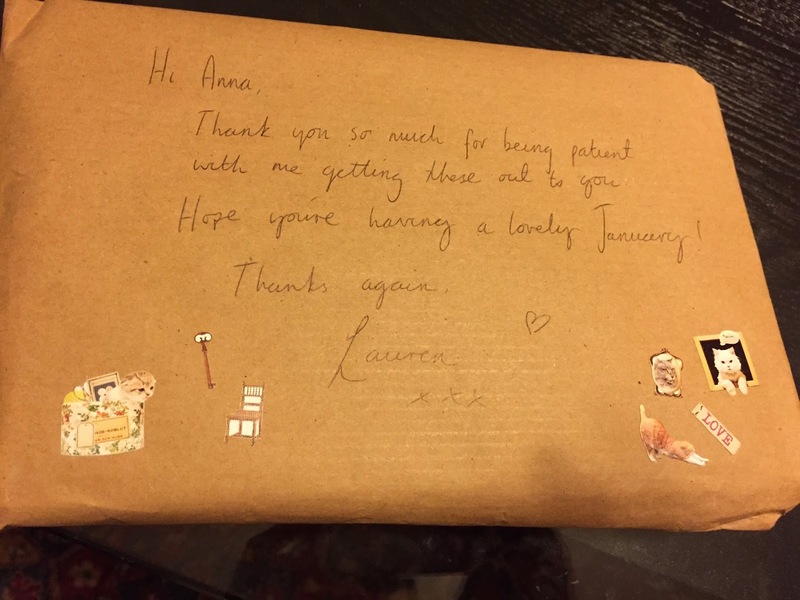 I want to say a huge thank you to Lauren for putting together such a lovely package for me, it's so thoughtful of you and put a whopping great smile on my face! I know it's slightly early to be thinking about Christmas, but I would definitely recommend this as a present for next year for young people or even for yourself if you're interested in some new and loved recipes. What a fab treat to get me through the January blues! Wow, a whole week has apparently gone by and I haven't really had a chance to blog. I guess that's what always happens when the holidays end and I go back to school because I end up with a load of homework, absolutely exhausted, and slumped in front of the tv by around 7pm. All meaning that I have little time to blog and nothing specific to blog about. I mean, who really wants to read a blog post about these incredibly mundane past few days?! Although, then I remembered that the posts I love to read the most are the ones which I think are the most relatable. And the ones I find most relatable are posts like these. Ones where it's about someone's real life and thoughts. So here we are. Prepare for a splurge of all things currently going around my head. You're welcome. It's always odd, going back to school. It feels like you've never been away and yet I've just had three and a half weeks off. I've been trying to appreciate everything a bit more considering that this is my last year at school ever and although I'll hopefully be at university next year, it probably won't be quite the same. Nevertheless, it's not easy to appreciate something that leaves you exhausted and crawling into bed at 9pm. Yes really. It's fifteen days into January and, if I'm being honest, I haven't really improved my exercise regime at all despite my goal to do so. I think that a lot of people are experiencing the same thing but I really am determined to get fit again so I must find the motivation to just do it. As my sister wisely pointed out over the holidays, when it comes to exercise, you never regret actually doing it, but you often regret not doing it. So even if I have a bad run or bad swim or whatever, it's always worth just going because it's better than sitting on my bum watching copious episodes of Gossip Girl (although now that I've written this, I'm going to have to actually get off said bum and close Netflix). With that in mind, I *will* go swimming on Saturday morning and even if I only manage twenty minutes I'm going to do it and slowly ease myself back into it because it's good for me and it relaxes me and it will set me up for the day. Something else I've also found fifteen days into 2015 is that, sometimes, people just aren't worth your time. And while that's a pretty pessimistic way of viewing things and I do like to try and see the good in everyone, life's too short (which I know is a cliche but must be one because it's the truth!) to spend your time on people who give you very little back. So I'm going to make sure that I choose my friends and time wisely over the next few months. Promise. I'm pretty sure that everyone has heard of Stephen Hawking. I learnt about him last year when studying the philosophy of religion and although I suppose I've always been aware of him and what a remarkable physicist he's known for being, I've always hated physics and never really thought about Hawking or his disease. One quote of his did strike me last year, however. I had to learn it for an exam when studying whether religion and science can ever be compatible but I really liked it. It went, "an expanding universe does not preclude a creator, but it does place limits on when he might have carried out his job!". Anyway, as I'm sure thousands of others did in the first few days of the new year, I went to see The Theory of Everything with my friends, which is based on the memoirs of Hawking's first wife, Jane, 'Travelling to Infinity'. The film was beautiful; poignant and heartbreaking with impeccable acting from both Eddie Redmayne and Felicity Jones. I bawled my eyes out from about twenty minutes in to the end of the film as the story unfolded and I learnt about two lives and what they'd been through, while both are still alive. It's not often you get to see films based on true events that follow people who are still alive today. I suppose that is why when I do see these films, I am even more moved than usual. More than anything, I found The Theory of Everything inspiring and am glad that I went because, in my opinion, it was truly brilliantly done and Eddie Redmayne's acting alone was outstanding. I have been reading articles such as this which suggest that Hawking is not as altruistic as the film may make him appear. And, while I think that such articles are definitely worth reading as it does seem that the film leaves out some important parts of Jane Hawking's memoir, it doesn't take away my feeling of awe at what Stephen and Jane Hawking went through. A film that is definitely worth seeing in my opinion. What films have you seen recently? I'm always looking for recommendations! For Christmas one of the presents my Dad got me was the Hummingbird Bakery Cookbook and my sister got me one of their aprons and cake tins - it's fair to say that I'm a little bit in love with the Hummingbird Bakery and their recipes. Having got back from Yorkshire I felt a little down in the dumps last week, so I decided what better way would there be to cheer myself up than to make their Nutella cupcakes?! The recipe is really easy and the result is absolutely *delicious*. 1. Preheat oven to 170 degrees celsius. 2. Put the flour, cocoa powder, sugar, baking powder, salt and butter into a mixing bowl and beat together (I used a hand mixer to do this but I'm sure you don't need one really!) until it's all combined. 3. Slowly add the milk, again beat until all the ingredients are mixed together and then do the same with the egg. 4. Spoon the mixture into paper cases (this makes 12 cupcakes) and bake in the oven for 20-25 minutes (mine needed a good 25 minutes) until they bounce back after being touched. 5. Leave the cupcakes to cool. 6. When they're completely cooled, hollow out a small section in the centre of each cupcake (I just used a teaspoon to draw a little circle on the top of each which worked fine for me) and fill with a dollop of nutella, replacing the lid after. 7. Once I did this I made the icing. Start by mixing the icing sugar and butter together until it's well combined. 8. Begin to add the milk and keep mixing until the icing is fluffy and light (I did this for about 5 minutes using a hand mixer). 9. Stir in the nutella using a wooden spoon. There you have it! Nutella cupcakes that are easy to make, yummy to eat, and that will cure any post-Christmas blues that you may be experiencing! So I've been thinking about what's important to me at the moment and about what I really want to achieve this year. I want to set goals this year that will allow me to be a better person and to gain more perspective on what truly matters and equally what probably won't matter in the long run. Towards the end of 2014 (still doesn't feel right thinking of it as last year!) I started to get into the habit of, when thinking about something that may be painful or the cause of apprehension in me, saying to myself 'will this really matter to me in a year?'. And, actually, I've found that 95% of the time, it won't. I can get so caught up in stuff that I don't allow myself to take a step back and think enough to realise that it will probably be okay. And that, if it turns out to not be okay, just like everything else, I'll learn from it. That's what a new year's about for me; learning and growing as a result of it. 2. Live in the moment more. 3. Be more conscious of what I eat. 4. Make more time for the people I want in my life. 5. Allow myself to make more mistakes in taking chances (within reason!). They're just a few things I want to concentrate on this year. Simple, perhaps, but they undoubtedly have the potential to make me grow as a person... if I can stick to them! Happy New Year, lovely readers! I hope it's everything you want it to be and that 2015 brings you huge amounts of joy and happiness. I welcomed in the new year with some of my favourite people, including Harry, at a house party. It was a really great evening which left me crawling into bed at my Dad's house at 2am with a great big grin on my face. So 2014 has come to an end, and what a great year it was. I feel that I've been very lucky over the past few years in being, ultimately, given some wonderful experiences. There have inevitably also been complications things that have been difficult to go through but, on the whole, I can't complain - I'm an incredibly lucky girl. 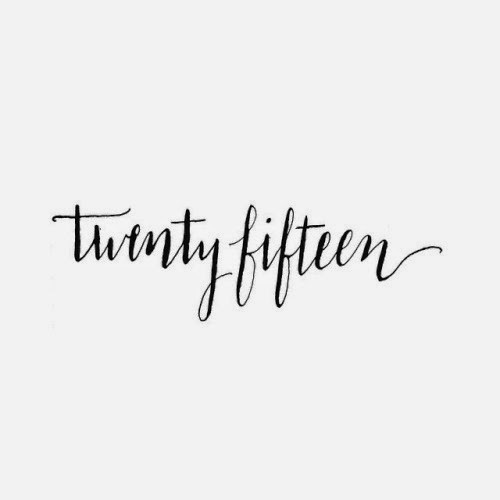 Nevertheless, a new year does mean a new beginning (as cliched as it may be to say) and I'm excited to see what 2015 has in store. At the start of 2014, I wrote my goals for the year, two of which I've recently reviewed that were reading goals. 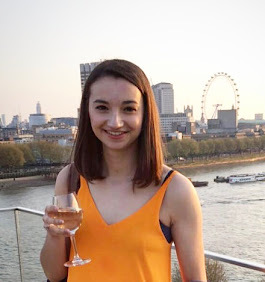 I thought I had better do the same this year so that I know I'm aiming towards something (I've always been a planner, me) but that I'd first see how I got on with the goals I set myself last year, which does not feel at all right to say yet! 1. Pass my AS Levels :: I did indeed pass all of them getting a C in Italian (my weakness), A in History, A in Philosophy & Ethics, A in Politics, and A* in my EPQ. 2. Say yes more :: This is something I'd like to carry on doing this year. I do think that in 2014 I was a lot more conscious in taking opportunities that were presented to me that I probably would not have taken otherwise, although I could have done more. However, at the same time, I think I need to be careful what I'm saying yes to, and that whatever it is I want to make sure is a feasible thing for me to do - I don't want to say yes to unrealistic goals. 3. Bake more :: I didn't bake as much as I would have liked to. But this is also ongoing and there were quite a few baking days dotted around the year so I'm quite pleased with this goal of 2014! 4. Blog more :: I definitely achieved this as in 2014 I wrote just over double the amount of posts I did in 2013, despite a few little breaks that occurred when life got a little hectic. I'm therefore over the moon with this one, and hope I can keep it up throughout 2015. 5. Worry less :: Now I am definitely one of 'those' people, the type that worries about seemingly everything. I just can't help it. Or so I thought. I've really worked on this in 2014 and, although I think I'll always be a worrier in some way, I'm worrying much less than I used to, and that feels great. 6. Keep writing in my five-year diary everyday :: I did it!! I've now got two years of entries into my One Line A Day diary which is so nice to have and will be amazing to look back on if I can keep it up for the full five years of entries.